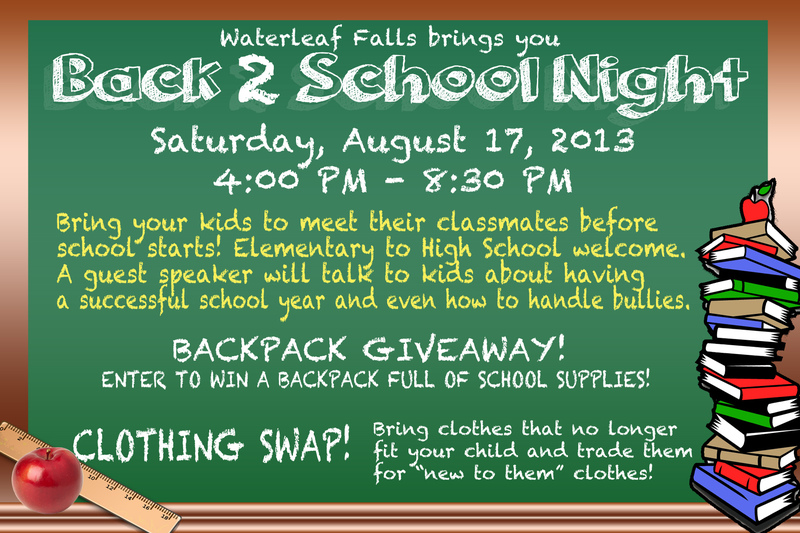 Join us Saturday, August 17th for Waterleaf Falls’ Back to School Night! This is an excellent way for our children to get to know one another before school starts on the 26th. Enter the drawing for a chance to win a backpack full of school supplies! Elementary to High School students are all welcome. We are excited to have Mrs. Traci Marant, school counselor for Tobias Elementary, joining us at 4:00pm. She will give tips for having a successful school year. She will also address the issue of bullying, the district policy, and what kids and parents can do recognize and prevent bullying. This is a very important issue we have all expressed interest in learning more about, so we are so grateful to Mrs. Marant for taking the time to talk to us. Additionally, there will be a clothing swap! Start cleaning out those closets! Please bring clothes your child no longer wears, but are still worthy items and trade them for new items to finish up your school shopping. (Please note, this is meant to be a trade so you will not be able to charge others for items they are interested in, even if you are not planning on taking items for your child.) The clothing swap will begin after Mrs. Marant’s presentation.